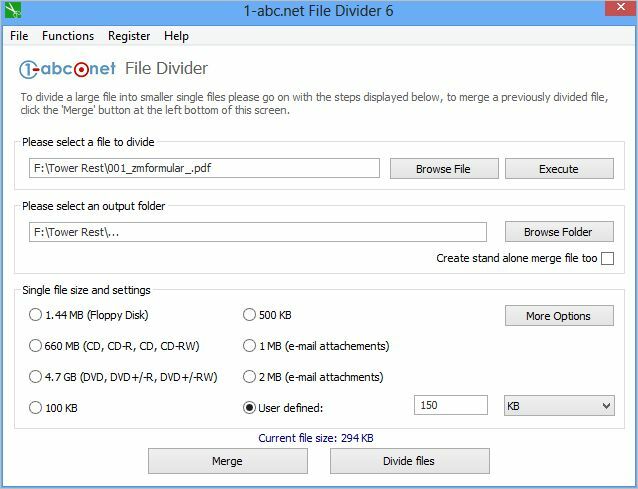 1-abc.net File Divider - Divide and merge large files! 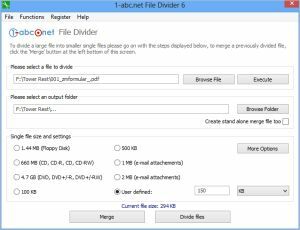 Divide and merge files for burning, sending by e-mail and much more! Isn’t it strange? Music, videos, documents, executables and other files become larger and larger while the capacity of camera cards, CDs, DVDs and e-mail attachments is often limited to a size below your needs. In times where compression is already integrated in most picture, video and sound files, an additional compression also does not solve this problem so the only chance you have would be to divide a file first, send or copy it to the used media and merge it after that is done again. But how can you do this? Windows itself offers nothing for it, even CD and DVD burning tools can not help you and e-mail clients can not do it too. The answer comes again from 1-abc.net: Divide any file of any type you like into single files of any size you need with 1-abc.net File Divider. This cheap, small, fast and very easy-to-use program solves all your problems you have concerning large files. Merging can also be done with an unregistered version of this product, so any receiver of your divided files is also able to get the data joined that you gave him.